The ICPI concrete installer course provides education on the construction of interlocking concrete pavements. As an ICPI-certified company, you’ll benefit from our unquestionable skills and expertise in creating various paved features. We have certified people who continuously receive training and skills enhancement from industry leaders, which means that our knowledge of the best practices and latest paving trends evolve with each passing year. Also, our certification is proof of our commitment to the profession, which is why we never rest on our laurels but strive to advance our skills and knowledge with every project we handle. The U.S. Association of Accredited Business is a membership based organization, advocating business ethics and helping member organizations reach their potential. Our mission is to protect, promote and advance the interests of our member organizations and their customers. Our USAAB membership means that we’re committed to advancements in consumer relations and remain relevant and responsive to our clients’ needs. Customers are also assured that our company works hard to maintain the quality of our landscaping and construction services. Our Better Business Bureau (BBB) A+ rating is the reward for our best practices, outstanding work ethic, and continued drive to ensure client satisfaction. Our clients are highly satisfied with our outstanding services, something that we intend to maintain for decades to come. As a Belgard Authorized Contractor, we are certified to work with the most excellent paver and wall collections in the industry. All Belgard products have a long history of successful applications on thousands of residential and commercial projects throughout the United States and Canada. Belgard pavers are designed to provide years of protection in all climates. As authorized installers, clients are assured of excellent installation of all Belgard products. Our certified professionals can handle installation of various hardscape features – driveways, patios, decks, walkways, and walls. With us, clients are guaranteed with outstanding results no matter how challenging the task may be. We’re honored to be recognized by Pinnacol as one of their 2017 and 2018 Circle of Safety Award winners. Risk control, claims management and workplace safety are top priority here at Aspen Falls to ensure our employees stay safe on the job. The Aspen Falls team is a proud supporter of the Susan G. Komen Breast Cancer Foundation. If you would like to raise awareness, donate or get involved please visit the foundations website at www.komendenver.org. Our inclusion in HomeAdvisor means we are a legitimate contractor with outstanding track record and impressive credentials. We offer excellent landscaping services to property owners who only deserve the best assistance possible for their property improvement projects. 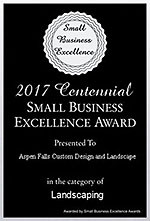 As recipient of the City of Centennial Awards, we take pride in our continued commitment to provide topnotch landscaping services to our valued clients. It validates our long-held beliefs that each client deserves nothing but the best-possible level of service from us.